After our record win over the 100km distance from Palm Beach to Coogee Beach in 2012, we repeated our 2013 win over 50km from Balmoral Beach to Coogee Beach in 2014 in a new record time of 5 hours 27 minutes. Sydney Coastrek will continue to grow and getting bigger and better with every year, however for time being without team Run 4 Vision. For 2015 I decided to catch up with my blind friend Francois Jacobs, who has moved to Melbourne, Australia from South Africa. Team Run 4 Vision, together with Tina and Jess participated in the 30km of the inaugural Melbourne Coastrek in November 2015. The stunning coastline of the Mornington Peninsular was an ideal venue for our trek and we finished in just over 5 hours, a time which put us into the top 20 teams out of over 400 teams participating. With a new Achilles Running chapter now operating in Melbourne, Francois has lost no time to prepare his own team ‘Achilles Melbourne’ for the 2016 Melbourne Coastrek. Together with his visual impaired friend Kevin Murfitt, they will be trying to better their time in the 30 km event in November 2016. 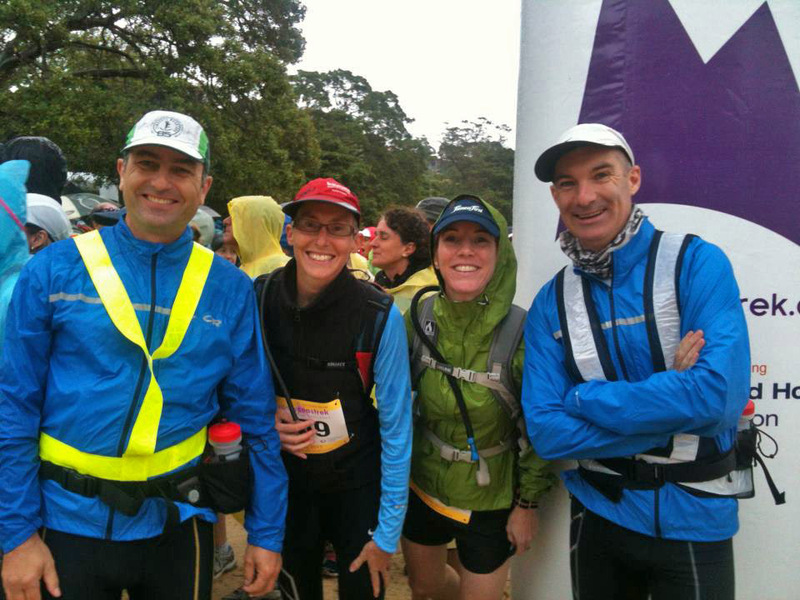 On a very wet and windy day in February 2013, Team Run 4 Vision finished the 50km night run as the first team across the line in Coogee after 5 hours and 34 minutes. Thanks to Melanie Barton, Samantha Isbell and Denis Martin for a great team effort. A big thanks also goes to to all who came to our Coastrek fundraising trivia night – we raised nearly $4000. That means that 160 people will be able to see again. At the finish line in Coogee 5 hours and 34 minutes later. After four months of hard training, spending hundreds of kilometres on the road and countless hours in the gym, Team Run 4 Vision kept its promise and finished the 100km Wild Women On Top Sydney Coastrek 2012, crossing the line as the first team after 14:28:55. We were showered, fed and fast asleep in bed when the second team arrived in Coogee Beach well over four hours later. It was a hard day starting at 6am, running in heavy rain for most of the day, along muddy tracks with nasty beaches to conquer and steep headlands to climb, but we fought through all the pain, knowing that thanks to all your support we raised enough money to help The Fred Hollows Foundation restore sight to over 500 needlessly blind people. At any race there will always be a first and last over the finish line, but that night and long into next morning, there were only winners crossing that line. Overall 1200 ‘wild and crazy’ but dedicated runners and walkers battled the elements for a great cause, and with the support of friends, families and strangers raised enough money to restore sight to an incredible 40,000 needlessly blind people! We all made a difference the world can see. Thank you. From left: Samantha Isbell, Joanna Sinclair, Denis Martin and Markus Schar.